It’s that time of year again when Tully gears up for the Golden Gumboots Festival. 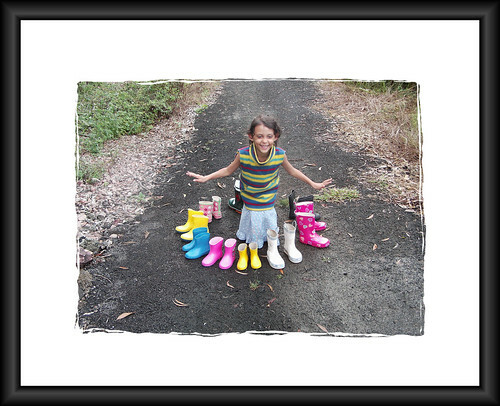 My daughter is considering entering the Golden Gumboot Quest. We’re not really into quests so how has this happened? In fact, the last time a child of mine entered one was my eldest son as a baby in a shopping centre and we won because he had eyes like me, let me see we won a small sash saying ‘ he looks like his mother.’ I am still not sure how we were roped into that one either. I think we might have been passing by. But my daughter, a keen artist, feels a float and an interesting dress for quest night would be loads of fun. I think we better keep her plans top secret for now. I think the motivation is that we feel the need for a bit of fun, joy and gumboots activity after all the cyclone recovery stuff, time to be silly and just go with the flow. All we know so far is that she must go to the Grand Parade, be available on the night of the Festival for the announcement of the winner of each Category and that she also has to prepare for a quest night, and have a sponsor. I think I may have already tracked one down. Now for other helpers – and equipment and more information and some hard work. Will I survive being Mum to a daughter in a quest? Probably, because it’s primarily for fun, and we’ll fund raise for some worthy cause. Do we care about the result? I don’t think so. We just want a float that rocks and I can’t wait to see watching my daughter take to the stage, she seems to like that a bit now she’s a teenager.